Thank you for the information Charles! It's good to know that we have another option for white trees. Yes I supposed we have already done the UV exposure test, haha. So our thought is that it was caused by all the chemicals/pollutions from spray paints and model shop fabrications that caused those trees to be yellow so fast. So hopefully using desiccant bags would slow it down. Yeah, our supplier does make the trees to order, so I suppose finding non-yellowing or low yellowing foam could be an option, just that the cost will probably go up, haha. Thank you so much for the tips! We will definitely try that out in the future. Since the model will be in the crate and traveling most of the time (not much exposure to UV), yellowing from oxidation will probably the main cause. So we decided to just paint the trees white, and then include lots of desiccant bags (silica gels) to reduce the oxidation process. We also not sure how much this will help, but I suppose we will know more a year from now, haha. We have also had this problem both in trees and in packaging. "we just saw that the white trees that we have from last year that had been kept in the metal cabinets for about a year had turned yellow quite a bit." Does that mean that your tree storage is in a largely dark metal cabinet. If so the yellowing is probably NOT from UV exposure. Also if you have a rack or block of these, if it was UV you should be able to see that the ones on the front or wherever gets more light than others should be darker. The photo you send suggests that the foam is yellowing uniformly. Skimming the literature it seems that common PU foams will all yellow but that UV and other factors increase the rate. Spraying with a sealant may help both by reducing the UV but also limiting air exposure. The presence of butylated hydroxy toluene (BHT), a commonly used antioxidant;"
There are a number manufacturers who are advertising low yellowing foams particularly for the garment, sportswear etc industries. It seems that the best solution is to ask your tree supplier (who I thought did make to order for you) to work with you to find a source for non yellowing or low yellowing foam. 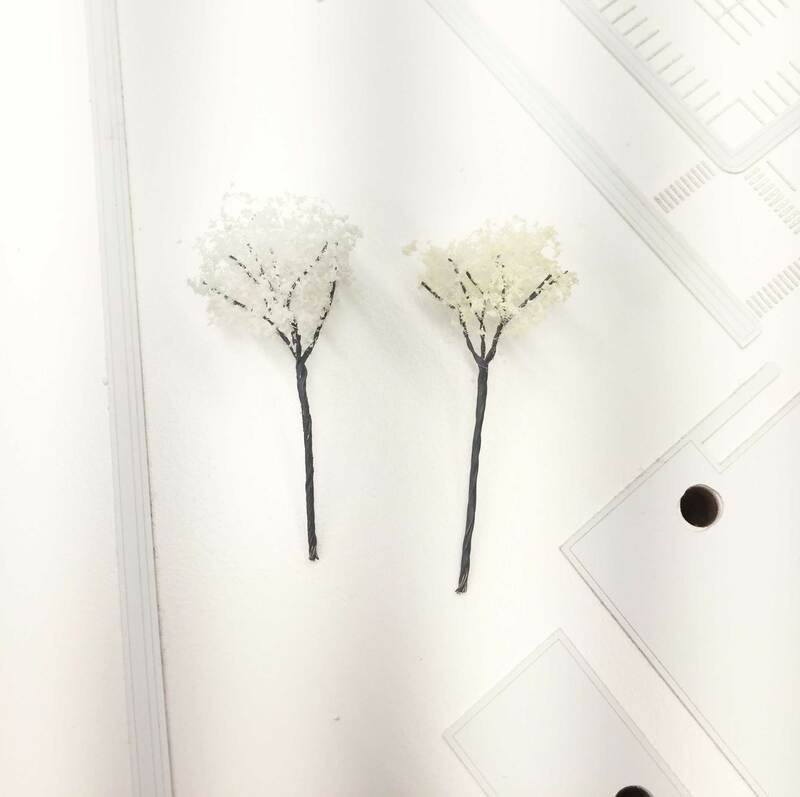 We have found that the white trees from 4D modelshop in the UK do not turn yellow. However, they are very expensive relative to other options. SamTrees (which I know you guys don't like) are painted white and seem to do better than raw foam trees but the underlying colors, (green, etc) do start to bleed through. We have found that the real problem with some tree maker's trees is that the foam is colored with latex paint, rather than dye. The reason is that it is easier to get the toned down colors that look best on wood and architectural study models. The foam dries out and turns to dust really quickly and, as you discovered, it changes colors as well. I cannot attest to our solution working yet, but we have been spraying our trees with a UV Fabric Spray hoping that they will last longer. I look for the most industrial one for tents or diving gear, and that claims to be colorfast, non-yellowing and doesn't get stiff. Like this, for example:: https://www.amazon.com/Bloc-Fabric-Spray-Protector-Trek/dp/B002WRQP2G. I wish I could say that I know it works for sure, but I just will not really know until I conduct a controlled test - one day. I hope this helps. 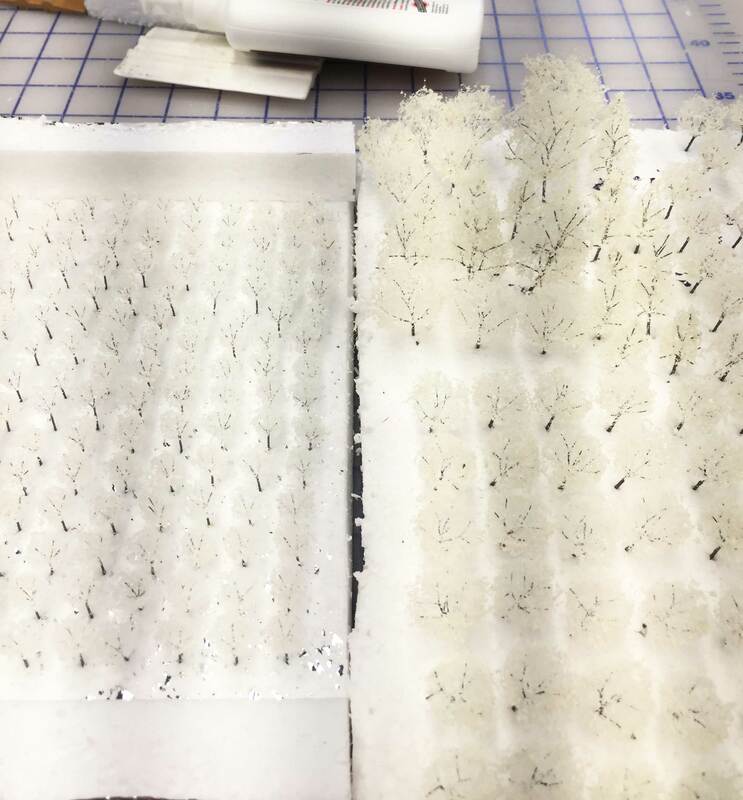 We are working on an all white site model and are using white trees for the model. We had worked on one last year which used the same type of white tree from the same supplier. However, we just saw that the white trees that we have from last year that had been kept in the metal cabinets for about a year had turned yellow quite a bit. Please see the attached photos in which it is clear that our new trees (on left) are quite bright white compared to our older batch of yellowed trees (on right). 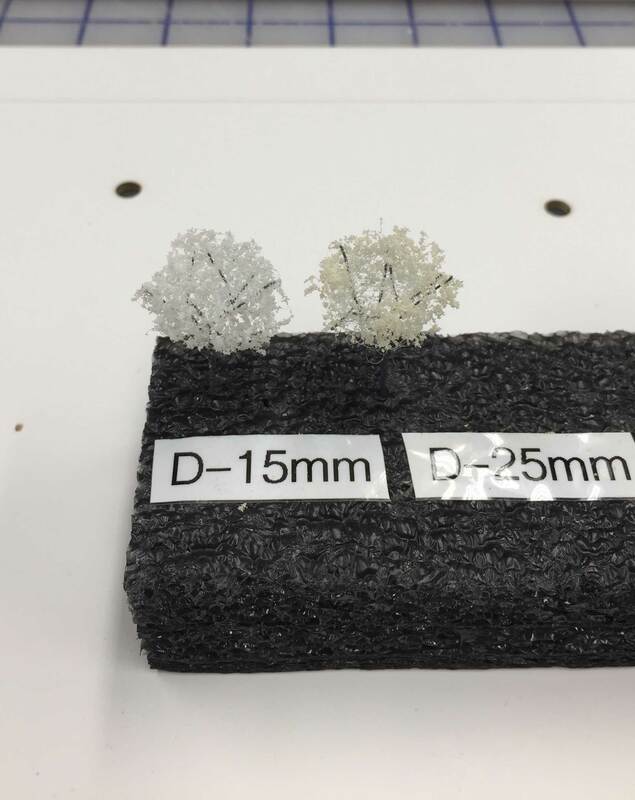 Our understanding is that since the flocking on model trees are made from foam, it will turn yellow eventually due to oxidation and UV exposure. Have anyone experienced this yellowing issue on white trees in the past and is there any way that we can slow this yellowing process down? We tried painting a few trees, but this did not reduce yellowness and gave the foam on the tree a gummy appearance, so this solution will not work unfortunately. Thank you so much in advance for all your professional suggestions.